Contemporary, versatile, and perfect for your master suite, the Alpine Furniture Legacy 3 Drawer TV Media Chest offers smart media and traditional storage in one. The top is spacious and designed to accommodate most flat panel TVs. Two media openings below each include a wire opening at the back. Three drawers below are there for traditional storage. The top features curved detailing and is felt-lined. All drawers are made with English and French dovetail construction and open via ball bearing metal glides. Square hardware at the top and open, geometric metal hardware below were inspired by jewelry. 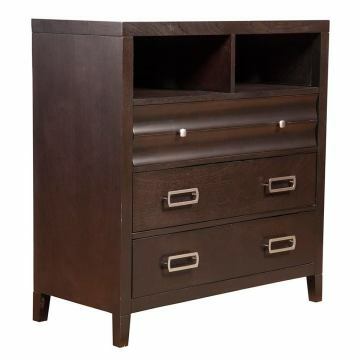 This media chest is built from plantation-grown mahogany solids and okoume veneers in a black cherry finish.